"Damn it! Why aren't they texting me back?" "Why are they ALWAYS late for dinner?" "Why did they say they could do it if they weren't planning on following through?" Do you ever experience these thoughts? I know I do on a daily basis! I can go from feeling on the top of the world, satisfied and happy with how my life is progressing, to completely bummed out when the actions of others do not align with the plan or expectation in my head. Isn't it crazy to think that the actions (or lack thereof) of others have such a strong affect on our happiness? This frustrates me to no end. I get caught in a cycle of believing that once x, y, z happens I will finally be happy and my life will be where I want it. The trouble with this thinking is that it leaves my satisfaction in the hands of others and in external factors instead of coming from me. As a control enthusiast (such a nicer term than control freak, no?) I find it difficult to accept that I can not dictate others' actions. "What do you mean I can't just tell them to do it and they will?" Well sorry sister, but people are going to do what they are going to do and you don't have too much of a say. Falling into the trap of believing that you have power over the actions and feelings of others (through your words, or influence, or whatever) is such a mistake. Of course, it is one that we all make very often. This only serves to leave us feeling even more out of control and disappointed, so how can we stop allowing ourselves to do this? Accept that you can only do so much. When it comes to dealing with others you can only do your best and leave the rest up to them. You can go on the best interview or date or whatever of your life but some people just aren't going to take the steps you want. And that's ok! I'm not a huge fan of the "everything happens for a reason" mentality, but I do believe that where one door closes another one will open. You just have to keep finding a door to knock on. Knowing when you have done all you can reasonably do and letting go after that is the goal. Be forgiving, but know your standards. People are going to make mistakes. YOU are going to make mistakes, so we all need to incorporate forgiveness into our relationships and life. You can't hope to be happy if you create an environment where anger and grudges are the norm. However, there is no excuse or reason to compromise your standards and expectations if someone is not meeting them (assuming of course that you have reasonable expectations. That can be another post for another day...). If you are continually upset after interacting with someone then it is probably time to let them go. Perspective is something I've blogged about before because I truly believe in it being an essential way to see how fortunate you are. I tend to put too much importance on events and actions which are outside of my control. Sure the outcome may have an effect on my life, but if I can't do anything about it why waste time and energy worrying about it? Answer: there is no reason. Stopping yourself can be difficult, but it is a simple case of mind over matter. 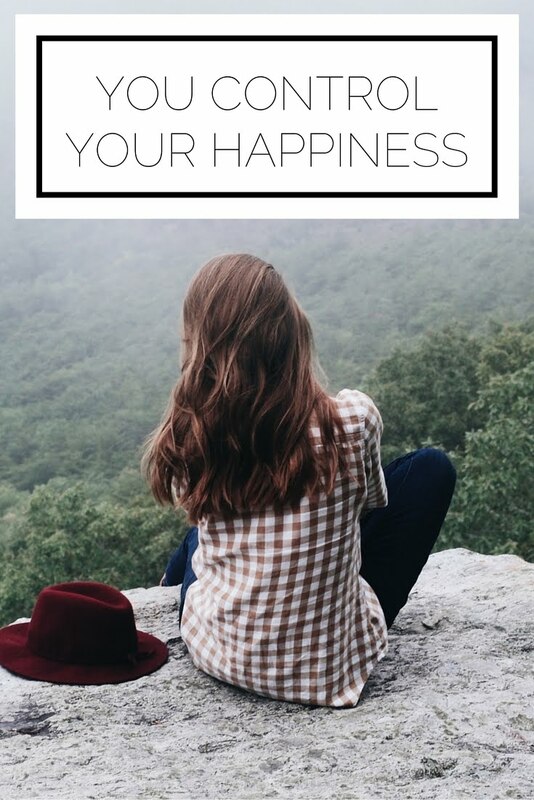 Happiness is yours, here and now, and it comes from YOU. Not from what happens to you, not from what other people do or don't do for you, and not from the crazy twists and turns that life throws at us. It all comes from you, so own it. 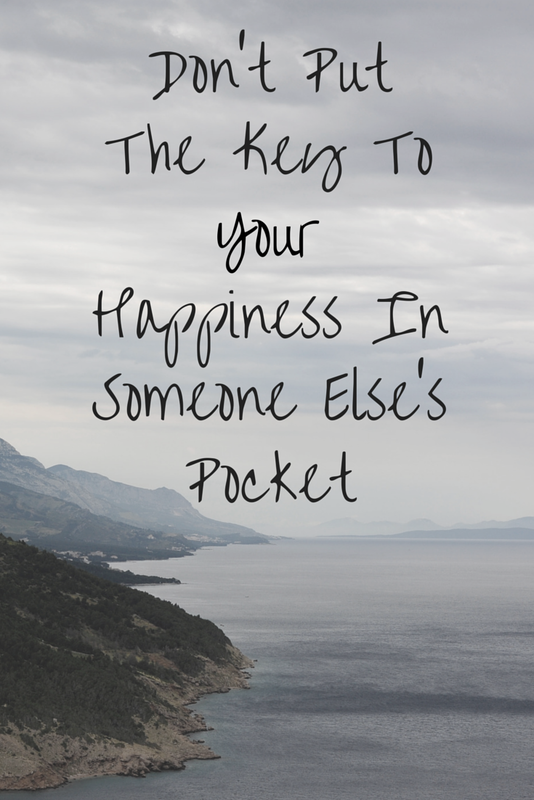 How do you derive happiness from yourself and not let others affect you?